Biology faculty at Hope College consider their job to be research with undergraduates. That doesn’t just mean working in a lab with a small number of advanced students — it also means designing the entire curriculum to support research with students, from Intro to Biology on up. It takes the real thing — grant writing, sophisticated equipment, student attendance at professional meetings, peer-reviewed publication — to teach the real thing. Studied biology in high school? If you scored a 4 or 5 on your AP exam, you’re eligible to receive credit toward one of our degree programs. The Biology department recognizes the skills and hard work of our amazing students. Each year, several awards are given to students based on specific criteria. Learn more about our awards. We invite students with an interest in biology to join a student group. Contact the Fried International Center for information about additional trips. 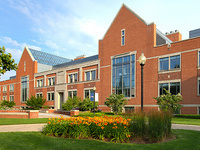 The Science Center has over 195,000 square feet of flexible, state-of-the-art teaching and research laboratory spaces.